Remove stems and quarter six of the figs and place them in a small saucepan. Add ¼ cup of balsamic vinegar simmer until the figs break down and the mixture thickens, about 6 minutes. If the sauce gets too thick a spoon or two more balsamic vinegar. Pound out 4 chicken breasts until they’re ¼- to ½-inch thick. Be sure they are all the same thickness. If they become too large, cut them in half or even thirds so they’re more manageable. Remove the stems from 4 more figs and slice them cross-ways into 4 slices each. Salt and pepper the chicken, place two or three fresh sage leaves on each piece, add two slices of figs on top of the sage, then carefully wrap the chicken in a slice of Prosciutto. Heat olive oil in a large sauté pan to medium-high heat, then add the prosciutto-wrapped chicken (cook in batches if they don’t all fit). After 4-5 minutes, flip them over and continue cooking until a meat thermometer registers at 165 degrees (F), about another 4-5 minutes. Place the chicken on a platter and cover until all the remaining chicken is cooked. Throw 8-10 large sage leaves into the sauté pan and “fry” each side for around 30 seconds. They should be crispy. Remove and place on paper towel to drain and sprinkle with salt..
To assemble, plate the chicken, add a few dollops of the fig balsamic sauce, and finish with some crispy sage leaves. 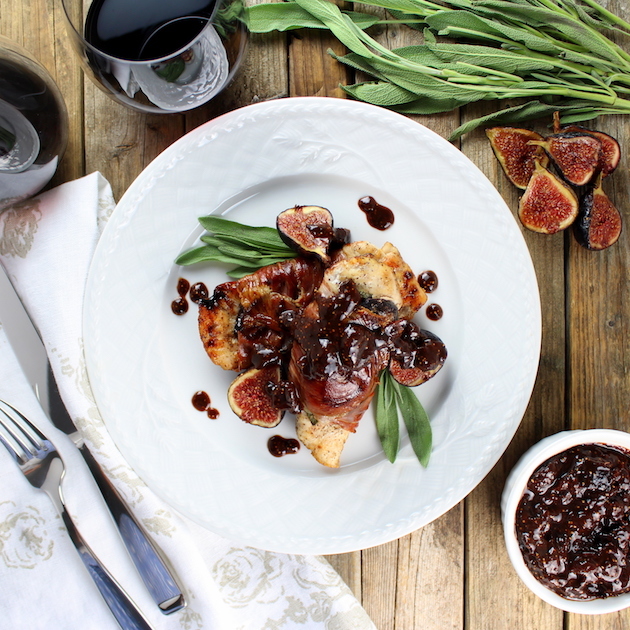 Recipe Notes: When reheating the balsamic fig sauce, add a few spoonfuls of balsamic vinegar or water to bring it back to a sauce consistency. When fresh figs are not available, dried figs may be used instead. 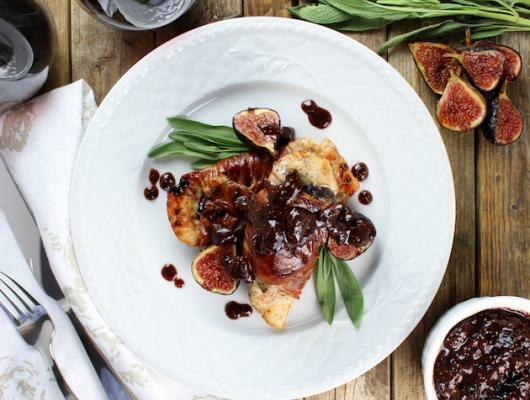 Chicken Fig Saltimbocca Recipe - Perfectly balanced with savory prosciutto, herbaceous sage, fresh sliced figs & a sweet balsamic fig sauce. Low-Carb, Gluten-Free, Paleo.